Ostrava of Boletaria is the Prince of Boletaria, whose real name is Ariona Allant. He is one of the earliest encountered NPCs in the game, and most frequently-encountered through the entirety of World 1. Ostrava seeks council with his father, the King, but quickly learns of the demonic farce that now sits on the throne. Overcome with grief and betrayal, Ostrava kills himself at the foot of his father’s palace, offering his belongings up to you. Through various conversations the player can have with Ostrava in the game, he reveals that the mighty Twin Fang Vallarfax ventured back through the fissure into Boletaria after warning the world. This might be considered an inconsistency, or an error on the part of the developers: Ostrava actually says that Biorr was the one who escaped through the fissure and that Vallarfax was never seen again, when in fact you see first-hand that it is the other way around. Depending on your interpretation this can change your opinion on the state of Vallarfax’s existence. Killing him in body form will shift your Character Tendency by -2. Drops the Mausoleum Key if he dies due to the player or enemy before he turns into a black phantom. This opens the door behind the Red Eye Knight in 1-1, where you may find Demonbrandt and Old King Doran. If he dies in an inaccessable place, or falls off of the world to his death, simply go to his spawn point in the current stage and load the game. The Mausoleum Key will be waiting for the player to pick up. If the player does not pick up his items on the next load, however, the items will be gone permanently. A bug might occur in which, if he dies in 1-1 after Phalanx is killed, he will reappear in 1-2 to be rescued. He appears in three places in Boletaria asking for your help against enemies, so in a way he proceeds through the level as you do. If he is not rescued in 1-2, and then his black phantom is killed in 1-4, his chain will be broken and not appear in 1-2 or 1-3. The Mausoleum Key will be lost for this playthrough. When rescued in 1-3, gives a Pure Clearstone as a reward. This is the only sure way to get this Pure upgrade stone without trusting Crystal Lizards. If rescued each time in 1-1, 1-2, and 1-3, gives the Mausoleum Key upon finding him in 1-4. Appears as a Black Phantom enemy in 1-4 just before fighting the 1-4 boss, regardless if the player helped him or not earlier. He is one of the assassination targets from Mephistopheles, earning you a Talisman of Beasts as reward from her when you succeed. When you talk to him at the end of 1-4, he spontaneously dies afterward. If you wish to kill him for Mephistopheles, you must kill him BEFORE talking to him in 1-4. Otherwise, you will not get credit for the kill and will not receive your payment from Mephistopheles (NOTE: while you won't get the reward for killing Ostrava, Mephistopheles will still ask you to kill the next victim and you can still get the Foes Ring). He can appear and die to enemies in Boletaria, and if you don't notice you lose his dropped key forever. For this reason many people choose to kill him earlier when they encounter him, just to be sure to get the Mausoleum Key. When fighting him, his Rune Sword will do a large amount of Magic damage component, so be prepared with good Magic defense and a Dark or Dark Silver Shield. His own Magic defense is also pretty good from his Rune Shield, so try using Fire attacks instead of Magic. 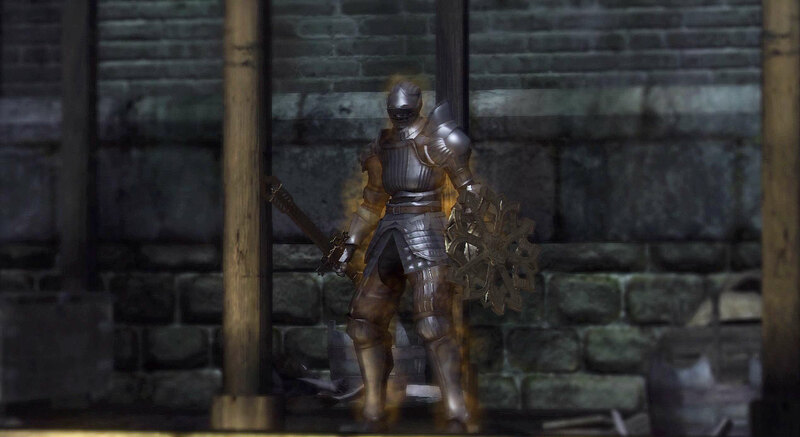 When you fight him as a Black Phantom on a narrow platform in 1-4 he will drop both his Rune Sword and Rune Shield when killed. If you want these items from his corpse, you need to be careful — use a thrusting weapon or one which will not knock him off the edge and lose the items. An alternative strategy is to lead him down the stairs instead of engaging him on the bridge. It is much safer here and not only will you not lose his corpse to a fall, but you will be sure not to fall off yourself. (Note: You can get these items in 3-2). In the North American version, BP Ostrava will fight Biorr if you lead him out of the castle and Biorr attacks him. It's not clear whether this is World Tendency or Character Tendency related, or just a glitch that got fixed. Note that Ostrava's damage, although not as much as Biorr's, is still fairly high, so if Biorr is severely weakened from the dragon fight, Ostrava may win. Take care, Ostrava's heavy combos are pretty dangerous. 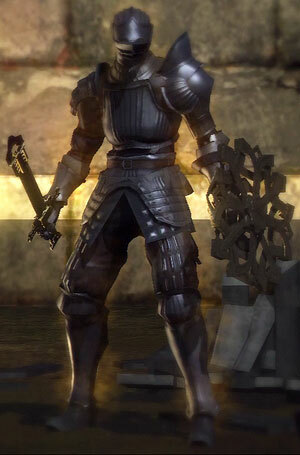 Black Phantom Ostrava will sometimes roll under pressure in melee combat; this can be used to your advantage if he is fought on the long bridge where he spawns. Dealing adequate damage in melee while the player and Ostrava are facing in nearly any direction not parallel to the bridge has the potential to cause him to roll to his doom. Be wary, however, as this can sometimes result in his armaments not spawning properly on load. In 1-1 after rescuing him, if you attack him he will ask you to stop. If you let him walk away and attack him again, he'll ask you to stop again without becoming hostile. You can take advantage of this: backstab him, wait that he walks away and backstab him again. Rinse and repeat until he dies and enjoy your loots. Also works in 1-3 after he is rescued from the knights. Use Poison Cloud as he runs up to you. You can either circle him until he dies or use Fire Spray to speed up said process. Ostrava will keep up the pressure as long as he still draws breath, so the only reliable ranged strategy requires you to keep backtracking, and depending on whether you killed it, Ostrava may simply die to the Blue Dragon breath while you clear distance. If you shoot Black Phantom Ostrava from the start of the bridge, he will jog in a straight line for you without holding his shield up. If you stand still and continue to shoot him with arrows, it is possible to kill him before he gets into melee range in a New Game. Equip the Thief's Ring and stand just on the red carpet at the top of the stairs near the start of the bridge, scope in with your bow and fire a shot at him from there. If you remain still, he'll run at you, but as soon as he gets halfway across the bridge he'll turn around and walk back to his post. At this point you can fire at him again and wait for him to run halfway then return to his post again. Repeat until dead. Kill the Blue Dragon quickly enough to save Biorr. After the dragon is dead get Black Phantom Ostrava to notice you and make him follow you outside. Biorr will attack Black Phantom Ostrava for massive damage (4-5 hits), but Black Phantom Ostrava will refuse to fight Biorr either turning around and walking slowly or just stand still. That was a bold jump! A surprise indeed! Well, now that you are here, pray thee, fend off these dreglings. Please! Help me! I'm trapped; surrounded by dreglings! My thanks for your brave rescue. I am Ostrava of Boletaria. Accept this as a token of my gratitude. Now, I must go. There is something for me to take care of. No matter how far I venture, only the soul starved remain. Is there a single sane person left in Boletaria? The king, his knights and his subjects were modest and plain, but also steadfast and compassionate. In the distant southern kingdom, Boletaria was known as paradise on earth. Hello! You yonder! Over here! It's me, Ostrava! Look at me, again surrounded by evil warriors. Could you, perhaps, help me one last time? Clear out the soldiers at the far end of this passage, if it pleases you. The Lord's Path, just down yonder, has degenerated into a feeding ground for flying dragons. Thank you. That makes twice. Thanks to you, I can now forge ahead. This is a token of my gratitude. Please accept it. This is bad… Not a single person left… Why on Earth? How did all of this happen… Father!" Help! Helppp! Soul-starved soldiers are after me! In the name of all that is sacred, please open this gate! Oh lord, hurry, please! They are almost upon me! Thank you for rescuing me. A dead-end? No! Help Me! I'll never make it! I'll be killed! You saved my life. This is the third time. I am truly indebted to you. This is… all I have, but please accept it. Now, I must go. My father the King awaits me just over there. King Allant led Boletaria with a round table of brave knights. and the brave tribesman, Long Bow Oolan and his fearsome legions. But today, Boletaria is an abysmal mess. Vallarfax was lost and Biorr slipped through the fissure, never to be heard from again. All the rest, along with Boletaria, have been devoured by the fog, and will soon be prey for the Demons. The Boletarian knights are no longer. But perhaps our age will see the rise of new heroes, such as yourself. My father is up above. Well, what's left of him, anyway. He's transformed into a fiendish Demon. I began this quest in a search for truth, but it seems I was a fool to even try. In his degenerated state, he can only bring peril to the lands. This key… fits the Boletaria mausoleum. Inside the mausoleum are my father's two swords, Soulbrandt and Demonbrandt. Use them to bring an end to this madness.